Our new collage topic is underway in our after school and home education groups. We have eased the children into the new term with a simple, one session activity that introduced them to some of the possibilities of collage. In preparation for this lesson, I visited a travel agent (thankfully still on our local high street!) and managed to get a donation of lots of old holiday brochures that could be cut up. Some of the children also brought along print outs of photos from their own holidays to add a personal touch. Each child was given a piece of A5 card which I had folded in half. They were told that they were going to use the brochures and photos to create a scene either reminiscent of their own holiday or of a fantasy holiday destination. Many children, in the end, opted for a combination of the two. Firstly they created their backgrounds, thinking about the setting. Would it be a beach scene? In the mountains? In a forest, or perhaps a city? Some children chose to also use pens to add details at this point which was fine by me. Once the background was created I showed them how to make the ‘pop up’ element. We did this by selecting individual buildings, animals, people or natural features from the brochures and gluing them onto some card. Then they needed to carefully cut them out (this is great practice for cutting skills and challenged even some older children), remembering to leave a tab at the bottom that could be folded and stuck onto the postcard. I demonstrated how to make sure it fitted into the postcard when flat by lining it up before gluing and checking the positioning. Once they had the idea, they got very absorbed in making their pop ups and some of the more able children even started to think about perspective, placing larger things near the front and smaller things behind. If they couldn’t find a picture of what they wanted to pop up in the brochures? No worries, they grabbed the pens and drew it themselves! A lovely example of building confidence and artistic expression. I think you’ll agree that they did a great job! Over the last few months I have had the privilege of working with Zach. Zach has severe autism and is non-verbal but had always enjoyed art activities when he was at school so his mum got in touch and asked if I would be able to provide weekly art sessions. A fantastic aspect of art is that it really is for everyone. Experimenting with colour and texture can bring joy on an enormous range of levels. One of the brilliant things about the way Zach enjoys art is that he is solely interested in the process; what captures his attention are the sensations involved in stamping, squishing, sticking, spreading, sorting. The finished product is of little importance to him which means that I have also had to cast aside any concerns about what we will be left with at the end. This has been quite a steep learning curve for me and one that I have found really quite liberating. I have come to realise that my role is to facilitate his experimentation and be willing to go with the flow. If he is particularly interested in squishing a sponge in paint then the whole session may consist of this is various guises. While I know how important the process is to all of the children I work with, it can be hard sometimes to not get distracted by a pressure to ensure they produce a high quality finished product. My weekly sessions with Zach are serving as a handy reminder that art is ultimately about pleasure, and enjoyment of the various processes involved in making art can be extremely powerful in the development of all artists. We have been having lots of fun this week in our mini classes making cornflour prints. This is a great activity to try at home as most people have some cornflour sitting at the back of a cupboard (probably out of date…don’t worry, it will still work!). All you need is cornflour and paint and you are off, creating beautiful marbled patterns which can be printed from over and over again. For those who have never tried using cornflour in this way it is a bit of a revelation. In the tub it will appear to be solid but scoop some up in your hand and, hey presto, it turn into a runny liquid. Drop it onto a tray and it will turn into a solid again. We created these marbled effects by doing this repeatedly with a few different colours and then pressing some plain paper onto the marbled pattern that had formed in the tray. This is such a simple activity but one that will keep little ones busy for ages as they watch the cornflour change state and create beautiful patterns. Put the cornflour in a bowl. Add the paint and a splash of water. Mix. Add a bit more water until the consistency is liquid while you are stirring but appears solid when you stop. Provide spoons, lolly sticks and other scooping/chopping utensils although you may find that hands are preferred! Mix up a few different colours, place in a tray allow them to explore! We have been going slime-crazy in our house over the last few weeks. I don’t know if it is a general craze or one limited to my daughter’s school but making slime is THE thing to be doing at the moment, apparently. They are making it at home and then taking it into school in plastic tubs to ‘play with’ at break time. My daughter making slime for her friends at 7am this morning. This all might sound rather odd but I have become really quite obsessed with finding the perfect slime recipe. We have had numerous disasters along the way and the internet is littered with recipes that, quite frankly, just don’t work. However, I am (probably disproportionately) pleased to say that we have finally cracked it. Such was our ‘Eureka’ moment that I thought I would share it with you so that you can avoid the kitchen disasters should the craze come your way. Put PVA glue in a small bowl. Add desired colour and the bicarbonate of soda. Mix well. Add 5 drops of contact lens solutions. Stir until consistency starts to change. Add 5 more drops and stir again. It should start coming together as slime at this stage. Put a small amount of contact lens solution on your finger tips to stop it sticking and scoop it out of the bowl. Stretch and pull the slime until it reaches a non-sticky, slimy state. You can always add a couple more drops of contact lens solution at this stage if need be but take it easy – if you use too much it won’t work. Less is definitely more! Once you get the hang of it it really is pretty easy. You can add glitter to it or maybe even some scent. Just make sure you store it in an airtight container or freezer bag as it will dry out. I am thinking about redecorating my hallway and so have recently been spending time mooching around the paint section of various DIY stores. Luckily, this is one of my favourite places to be (a bit sad, I know). I just love seeing the vast array of colours and shades laid out before me on the colour swatches. The possibilities seem endless; before I know it I’m getting carried away with all sorts of ill-advised colour combinations and have calm down and remind myself that I actually went in looking for a subtle shade of grey! The other great thing about these colour swatches is that they are free and you can (within reason, I guess) take as many as you like. They are super for making art with and children will no-doubt get just as excited as me by all of the lovely colours. Grab a handful, cut them up into separate squares and ask your child to sort them into piles of reds, blues etc. They will be astonished at how many shades of each colour exist. They can then stick them down in a take on a colour wheel, perhaps going from darkest to lightest shade for older children. Or, maybe they could use them to make a rainbow, thinking about colour order and using a mix of shades. Another idea is to sort them into colour families and then cut them up into smaller pieces to use in a mosaic. Your child could design a tile on a piece of square card and then use these small pieces to decorate. This looks really effective. I also love the idea of asking children to match up painted pegs with various shades (pictured below). This will really get them thinking about the concept of lighter and darker which will help them out massively in other art work. I’m sure there are many other uses as well, for grown up artists as well as children. I’d love to know if you have used these swatches in art activities in different ways. Please share your thoughts and ideas! It’s getting close to the end of term and those of us with children in school or pre-school are starting to think about presents for teachers. At my children’s school parents mostly club together and contribute towards vouchers. Speaking as somebody who was a teacher, this is fab. It’s lovely to be able to use the vouchers to choose something that you really would like. That being said, the presents I most remember receiving as a teacher are the homemade ones. It is lovely when a child goes to the effort of making something at home. Despite what parents might think, teachers are genuinely touched by such offerings, no matter how ‘homemade’ they are. I have kept cards made for me by children in the first class I ever taught and they hold very special memories. With that in mind, I have been trawling the internet in search of some inspiration for this year. I have tried to pick out ideas that are appropriate for even the littlest children to enjoy. This lovely hand print plant in a pot has a nice message and is perfect for children leaving a nursery to start ‘big school’. 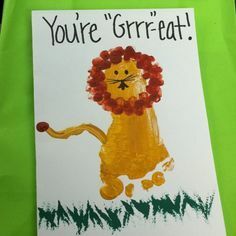 This lion is grrreat and will be a sure fire hit with little ones into animals with big teeth! For a slightly more mixed-media option, why not have a go at this wax resist card? Small children could draw a picture while older ones might write a message. 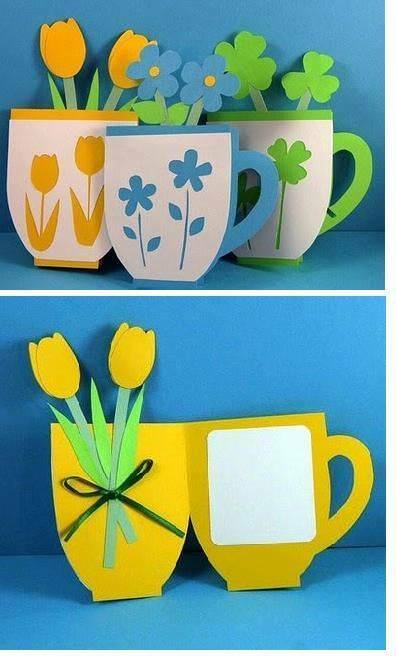 For slightly older children, this flowers in a cup idea is very effective. 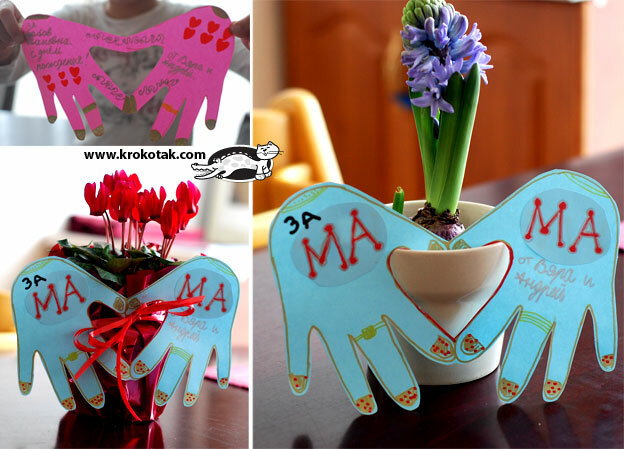 This is a lovely way of using little hands to make a personalised gift. I hope you find these suggestions helpful – I will be trying out a couple myself!